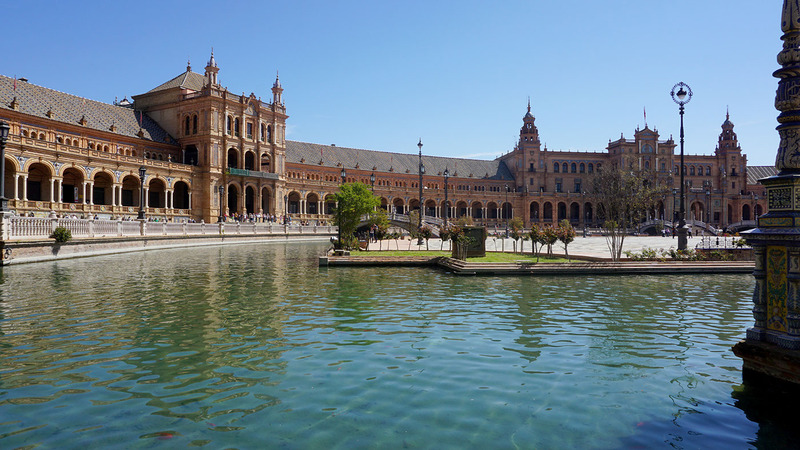 ICISP offers fall, spring and summer study abroad in Seville, Spain. Seville is the capital of southern Spain’s Andalusia region. Sitting on the banks of the Guadalquivir River, Seville has a rich Moorish heritage. The streets and squares in the historic quarter provide a lively version of the culture and beauty of the region. The ornate Real Alcázar castle and grounds, built during the Moorish Almohades dynasty, was registered in 1987 by UNESCO as a World Heritage Site. The gothic Cathedral de Santa Mariá de la Sede is the site of Christopher Columbus’s tomb and a minaret turned bell tower, the Giraldo. The General Archive of the Indies is the world-renown repository of rare archival documents illustrating the history of the Spanish Empire in the Americas and the Philippines. Culturally, Seville is the heart and soul of flamenco, the national dance of Spain. The International College of Seville (ICS) is a private, independent cultural institution, recognized by the Government of Andalusia under the Spanish Education Act of 1991, and is authorized by the Ministry of Education and Science of the Junta de Andalucia to offer U.S. college-level courses. The classrooms, library, tech center, study areas and administrative offices occupy a three-story Andalusian villa located in the charming neighborhood of El Porvenir, next to the beautiful María Luisa Park. This total immersion experience includes family home stays and overnight excursions to Cordoba and Morocco. Semester: Spanish is offered at six levels: Beginning I/II, Intermediate I/II and Advanced I/II. A typical schedule might include two Spanish language courses, a Culture and Civilization of Spain course and 1-3 other courses taught in English by local faculty. These elective courses are typically composed of social sciences, business and humanities. No previous Spanish is required. Students with college-level, advanced Spanish proficiency can enroll in courses taught in Spanish at the University of Seville. Summer: Students enroll in 6-7 credits. Spanish is offered at six levels: Beginning I/II, Intermediate I/II and Advanced I/II. Students also enroll in the Culture and Civilization of Spain course, which combines classroom lectures with experiential learning through local excursion to museums and historical sites. No previous Spanish is required. Included in the program are the various cultural excursions of the Culture and Society of Spain and/or the Three Cultures course, including trips to Cordoba, Morocco and faculty-led tours of local museums, Alcazar, the cathedral and various Sevilliana neighborhoods. Students can participate in “intercambios” to practice speaking Spanish with local students, as well as service learning opportunities around Seville. Spanish cooking lessons and flamenco classes are available. Students live with local Sevilliana families, in a single room with shared bathroom, all within walking distance of the ICS facility and downtown Seville. Host families provide 21 meals per week, including the option to request a “meal to go” when necessary. Laundry and internet access is included.